The second episode of Agents of SHIELD, “Meet the New Boss”, is focused on the new Director of SHIELD. Before we jump into that, “Meet the New Boss” gives us more insight into the “ghost” from the premiere episode, explores how it is effecting Agent May, gives us a bro team up with Fitz and Mack, and more Skye vs. Ghost Rider action. SHIELD opens on the ghost woman from the premiere episode visiting a house in Pasadena. The intro had vibes of “The Sixth Sense” with a child seeing the Ghost first. The father then sees her and is attacked. He is left seeing the blacked out face of his son, similar to how May sees Coulson at the end of the premiere episode. Fitz is back at base researching the box that held the ghost lady. His research leads him and Mack on a mission to a facility in Pasadena. Ghost lady is already at the facility and we learn there are 5 additional ghost boxes. Ghost lady opens one of the boxes and we meet “Hugo” the ghost man. Hugo then asks “Lucy” what she did to them. By the end of the episode, 2 additional ghosts are released, “Vincent” and an unnamed ghost man. The 3 named ghosts take off with the 2 remaining ghost boxes and unnamed ghost man is left behind to blow up the building. 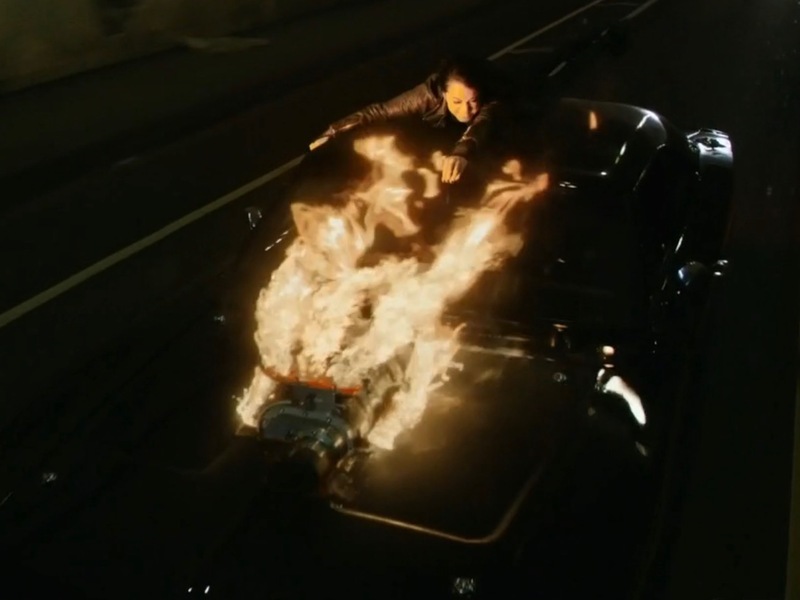 Fitz stops the building from being blown up and is saved by Ghost Rider who appears to incinerate unnamed ghost man. R.I.P. unnamed ghost man. I consider myself a big Marvel fan, but I had to do a little research on this one. 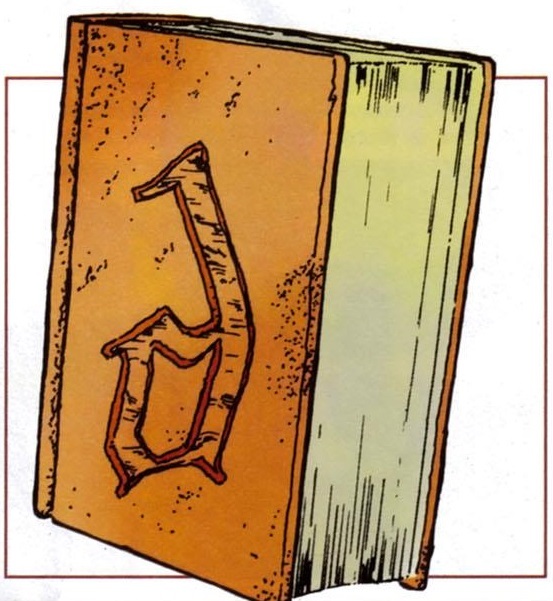 During the interaction with the ghost peeps, Lucy mentions the “Darkhold.” What I discovered is that the Darkhold is an ancient book of evil works and spells by an “Elder God” known as “Chthon.” The book has been around for billions of years. Most notably it lead to the first Vampire in the Marvel Universe. This of course brings names like Morbius and Blade to mind. 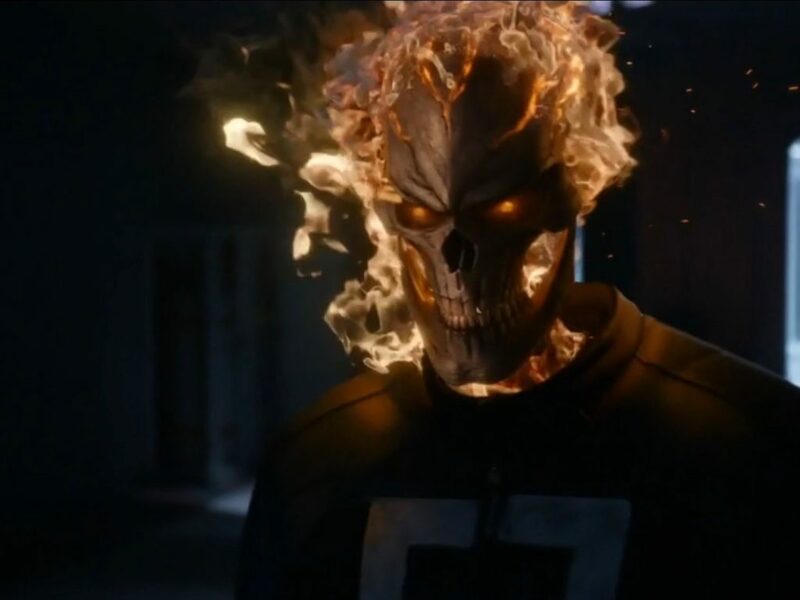 With this season focusing on Ghost Rider, it makes total sense to have the bad guy being an evil, celestial God. 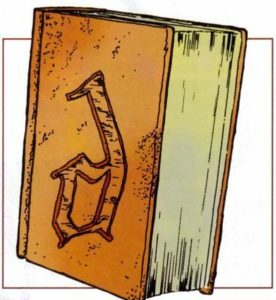 We have no idea if Chthon will be involved in the show at all or if vampires will be introduced, but the inclusion of the Darkhold really opens up the door for some evil and freaky stuff. Good thing Halloween is just around the corner, I expect an extra creepy episode that week. At the end of the premiere, it’s revealed that May has been affected by ghost woman (Lucy) and sees Coulson’s face turn black like a horror movie character. This is amplified through the episode as May starts seeing more and more faces turn black. She confronts the detained Chinese criminal who opened the ghost box in the premiere and was also affected. As she is speaking to him, he begins to bash his head against the glass until Simmons knocks him out. May is rapidly becoming more affected to the point where she believes everyone else in the base is “infected”. This leads to a cool fight scene where May fights off Coulson and her full squad of agents. As May tries to leave the room, the new Director steps in to help stop her (more on that in a minute). At the end of the episode, May is in the custody of the Director who tells Coulson that he is too close to May to deal with the problem and that it would be handled. 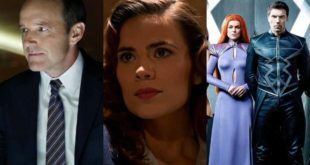 It appears that Coulson and the Director have a semi-positive relationship, but Coulson being kept from May could present a real issue between them. I mentioned in my review for the premiere last week that I was confused about Skye’s motivation. I would like to say that “Meet the New Boss” has cleared things up, but it hasn’t. In fact, I am even more confused as to what her plan is. Here is what we know. Skye left SHIELD, although a reason was never really given. She doesn’t have any of their tech, so when she uses her powers her arms break. SHIELD has developed a pill that helps her heal and YoYo (as seen in the premiere) is secretly meeting with her and providing her the pills. The only takeaway from her behavior is that she is truly a vigilante stopping bad guys. In “Meet the New Boss”, she tracks Robbie Reyes (Ghost Rider) to where he works and confronts him. Her motive is that he shouldn’t be killing people. We get the whole, “I sold my soul to the devil” story again. Skye then threatens Robbie’s brother, Gabe, which you can imagine doesn’t go well. Robbie’s eyes go red and whatever he’s holding he can light on fire. While the rules of Ghost Rider in the MCU aren’t known, it appears that he can control the power to a certain degree as long as he doesn’t transform. If he does transform, the assumption is that he is no longer in control and Ghost Rider is. After a small fight and a lot of non-informative talking, Robbie rushes off to save Fitz and incinerate the ghost, as mentioned earlier. The episode ends for these two as Robbie pulls up to Skye and says that he thinks the Ghosts are after him. Skye gets in the car and they rides off into the sunset. The only decent moment we get with Skye is near the end, on board the Quinjet, as Mack bandages up her arms. There is a very emotional exchange between Skye, Fitz, and Mack about why she left and why she isn’t coming back and how that decision, either way, still affects the team. 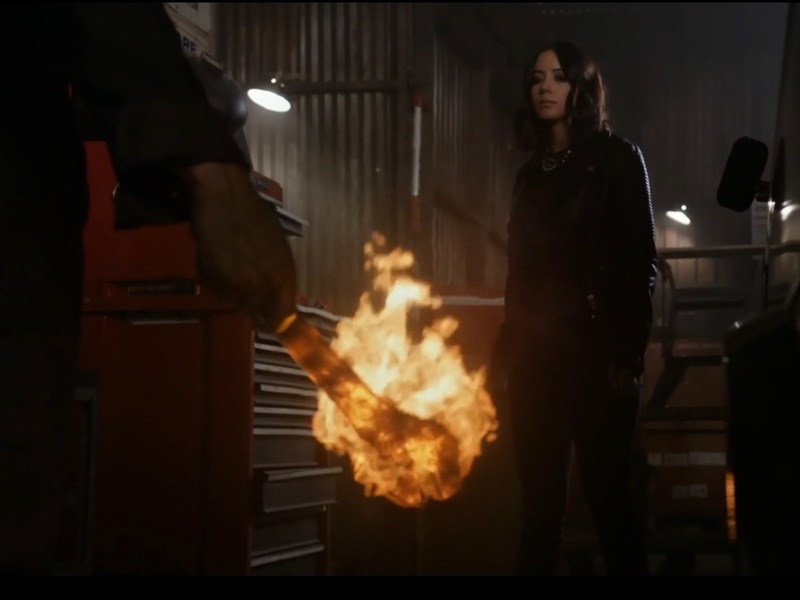 It gives me some hope that Skye won’t be a complete waste this season, but so far her story-line is a dud! Finally, the episode features three key scenes giving us some really good insight into who the new Director is. The first scene is a sit down with Coulson and May. Coulson refers to the Director as “Jeff” (or possibly “Geoff”) which could hint to his identity, more on that in a minute. 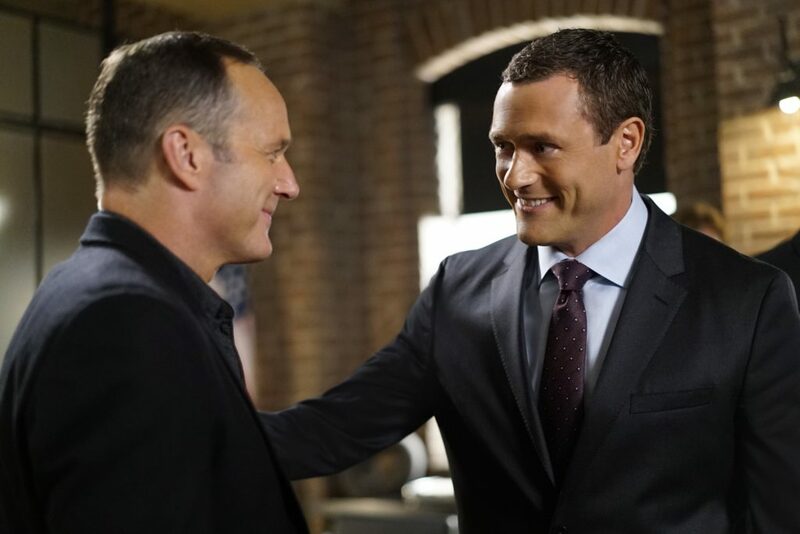 The conversation the Director has with Coulson and May revolves around PR for relaunching SHIELD. He is afraid that a former agent, in this case Skye, could create very bad “optics” for the SHIELD relaunch campaign. The second scene with the Director is, without a doubt, the biggest twist in the episode. 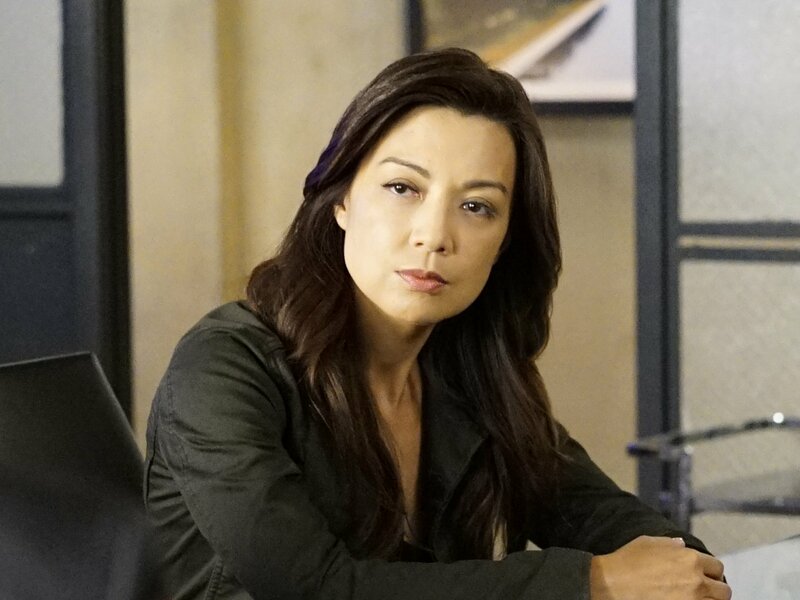 During the scene where May is attacking Coulson and her squad, she turns to leave and runs into the Director. She then hits him and he doesn’t flinch. May calls him a “Monster” to which he replies, “I prefer the word, Inhuman”. The Director then picks up May, one headed, and smashes her into a brick column, knocking her unconscious. So that’s your twist, the new Director is an Inhuman. The final scene, which I mentioned briefly above, is a scene between the Director and Coulson. It contains several good bits of information. First we learn that Phil chose to step down from being Director. Coulson didn’t want to be the “face” of SHIELD anymore. The Director said, after Captain America went AWOL, that Coulson wanted a “hero” and Phil responds that he wanted, “A powered person that the public could trust…and they came up with you.” This clearly means that Jeff wasn’t Phil’s choice. 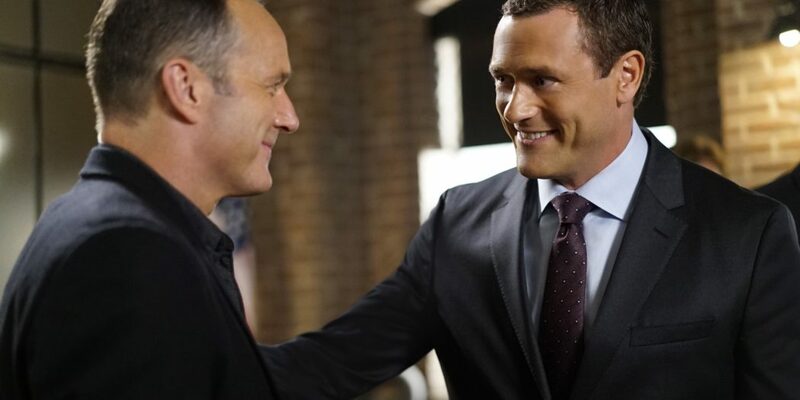 Jeff then tells Phil that he is a top adviser but when it comes to May and Daisy, he can’t be “objective.” He then tells Coulson that what he has planned for May is, “classified.” Thus, the Coulson vs. Inhuman Director story-line was born. There is a lot of talk about who the director is and I have my own theories. For me, there are two prime candidates. First, Jeff Jordan, also known as Captain Wonder. Besides them sharing the same name, Jeff also has enhanced strength. 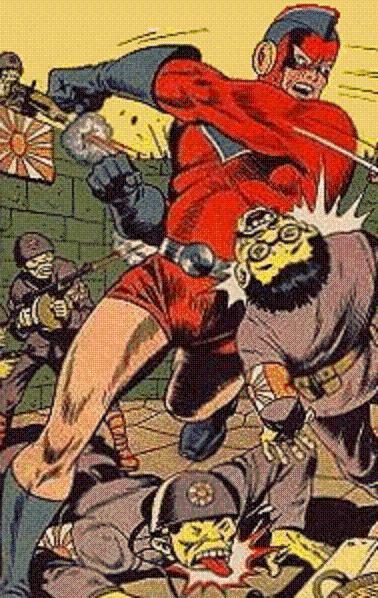 The trouble with Captain Wonder is that he was a Golden Age character and originally fought in World War II. He also invented a drug that gave him the strength of 12 men, so he is not an Inhuman as it appears that the Director is. The second choice would be Alaris, an Inhuman with super strength and abilities. Alaris appears human in form, much like Daisy. Alaris also doesn’t ever have an earth name, so Jeff could still work. He is, obviously, an Inhuman which fits. 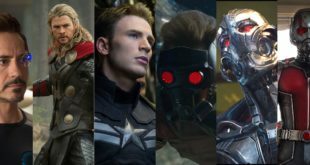 My honest opinion is that the word “Inhuman” has a different meaning now in the MCU. This is a theory, but I think the “Inhuman” project failed both in Comics and TV/Film. So I believe they are going to now use that word for all powered people, much like The Flash calls them “Metahumans”. If that is the case, I believe the new Director to be Jeff Jordan, former war hero, who the public trusts, who has superhuman strength so therefore, is technically, in-human. Of course, knowing my record in Vegas, I’m sure he is someone else entirely. Agents of SHIELD has not started very strong. 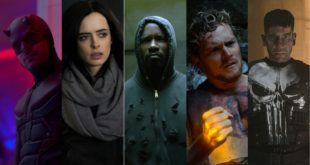 Two episodes in, Skye is all but pointless, May appears to have been taken off the board for an unknown amount of time, and FitzSimmons has been all but anti-climactic after the build up to their relationship last year. In fact, Simmons has had nothing to do at all in the first two episodes. Ghost Rider still has me intrigued, but I need to know more and I need to know soon. As it stands, SHIELD has a long way to go to keep fans engaged. The good news though, is that there are some good story threads in there to be pulled on.